One can't be expected to know how to properly behave in all social situations. You might address your questions about sticky social or personal problems to someone like Miss Manners, but really, why settle for a poor substitute when there is a higher authority? In the lovely little book How the Queen Can Make You Happy, author Mary Killen looks to her majesty for lessons on how we can all live happier, more fulfilled lives. During her more than 60 years on the throne, the Queen has had to perform enough public duties to take the tarnish off anyone's crown. Even today, she has more than 370 public engagements every year and receives over 50,000 official guests at Buckingham Palace. She also has a stack of official papers to read every day. Yet throughout it all, she maintains an air of dignity and contentment. How can this (now elderly) lady maintain such a full schedule and do it so well? By looking at the actions of her majesty, as well as what little information has leaked out from acquaintances about her personal life, the author gives us a glimpse into what makes this remarkable lady perform her duties so graciously year after year in the public eye. The advice is divided into such subjects as Compartmentalization, Frugality, Rising Above Things and Mystique. In the chapter on Compartmentalization, the author recalls the Queen's absolute attention to duty, no matter what else might be going on at the time. The ability to focus on the job at hand, without worrying about past or future problems, is something the Queen has been able to perfect to a remarkable degree. The author points out that on the day her sister, Princess Margaret, passed away, the Queen continued with her official duties (although she did change to a black frock to mark the somber occasion). We also learn that the secret to the Queen's vitality is her regular dining habits, as well as a dedication to walking and riding, no matter what the weather. Sticking to a regular schedule, whether that involves eating, vacationing or entertaining, keeps you from having to worry about details. Of course, a great deal is also mentioned about the public nature of the Queen's life, something most of us (thankfully) never have to worry about. Great attention has been paid to ensure that the Queen will not be caught out in unfortunate situations. For instance, she eats very little at public occasions (refusing samples when touring food establishments, something I would find very difficult! ), has weights or linings sewn into her dresses to thwart inopportune gusts of wind and doesn't sit at formal functions. She also has famously refused to give personal interviews or public opinions on subjects, so that her viewpoints and biases have remained mysterious. This has helped to maintain the admiration of the public for her quiet, noble presence (a lesson her relatives unfortunately haven't always mastered!). 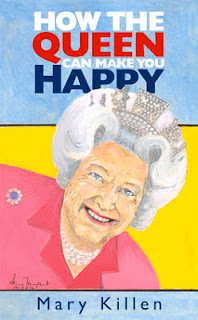 The Queen is happy because her life is very structured, she finds contentment in her service to others and she can concentrate her efforts on being in the moment and making each person feel important and valued. The advice in this book can help all of us to have a more dignified, content outlook, which will surely help us rule our own "palaces" more gracefully. The book also contains black and white photos between chapters of the Queen appearing on the stamps of various commonwealth countries throughout the years. I really enjoyed reading the book, and learning some of the personal anecdotes about the Queen, her marriage and Prince Phillip (who comes across as a very sympathetic figure, something that hasn't happened a lot recently! ).